In an effort to get an early start on the first of my New Year’s resolutions, I spent a good chunk of this weekend knitting socks. Not just any socks, but socks (well, one sock so far) of many colours. I have a bag of yarn odds and sods of sock yarn that I inherited from a crafty friend when she passed away, as well as many years worth of my own leftovers. I thought that it would be nice to use up this bag, but to do so means that I’m going to have to make some very interestingly-coloured socks. So far this sock has used six different leftover yarns, and I hope to use one or two more before it’s done. 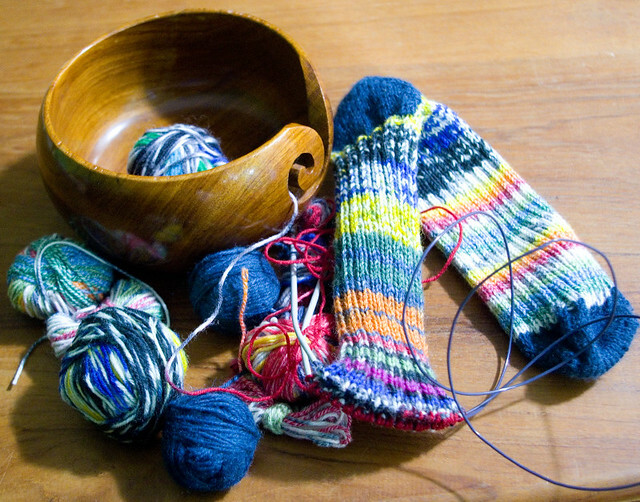 I divided the balls in half by weight and pattern, so the second sock should mostly match — although the colour repeat on some of the yarns is so long that it won’t be perfect. In the end, the pair of socks will be completely unique and hopefully a lot of fun!